August 18th, 2013 | Faces of Wheaton. From 8 a.m. to 5 p.m., Bill Ballantine is a successful salesman for Wheaton agent, Corlett Movers & Storage. After 5 p.m. though, Ballantine takes off his sales hat and transforms into a different person. Night after night, he becomes what so many people dream of being: the drummer for his rock band, The Clayton Brothers Band. 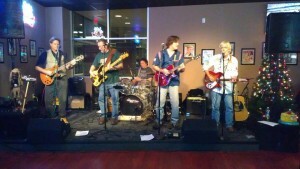 Formed in 2004, The Clayton Brothers Band came together simply because the five band members wanted to have fun playing some of their favorite old songs. All band members proudly claim themselves as members of the Baby Boomer generation, so naturally the band gravitates more towards songs from the 50’s and 60’s. This isn’t your average oldies band though. “When picking our music, we always have and we always will choose a more primitive approach to our song selection,” explains Ballantine. “We look for songs that have some attitude and we cover bands like The Kinks and Yardbirds.” This distinct musical style is what has put the Cleveland-based band on the local and regional map. The Clayton Brothers Band weren’t sure that they would be able to cultivate loyal listeners who liked the same, somewhat obscure music as them. Much to their surprise though, they’ve garnered quite a cult following with an audience that grows every year. “We play music that is truly special and music that is loved by people of all ages. Every night that we play, we make a connection to our audience that can’t be matched.” It’s that audience connection that has kept the Clayton Brothers Band playing for all these years. When asked what Ballantine’s and the band’s goal was in playing, he said it’s very basic. “We want to have fun and we want to invite the audience to have fun, too.” Judging by the pictures, it looks like The Clayton Brothers Band have achieved that goal. Bill Ballantine has worked for Corlett Movers & Storage since 1986 and except for a brief year and a half break, has worked there for all 27 years. Ballantine is a sales person at Corlett and has enjoyed his years both with Corlett and with Wheaton. “Wheaton is responsive from the top on down the line. As a sales person, knowing that your agency and your van line do what they say they are going to do is imperative and Wheaton does that,” Ballantine said.